Making a pate can be quite cumbersome. This is a shot-cut version. A very nice and salty appetiser. Dairy free. Can be served on toast, on cucumber slices or on crips bread (I have included a link to a precious recipe for this). 1. Place mackerel, mayonnaise and mustard in mixer and blend until smooth. 2. Add the chopped gherkins. Season. 3. Using a piping bag (with a nozzle large enough to accommodate the gherkin pieces), pipe onto gluten free crisp bread. Decorate with parsley. 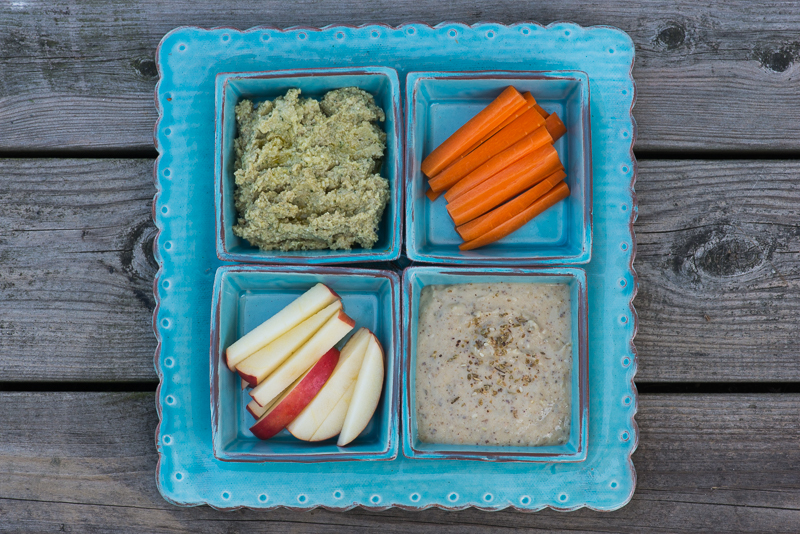 Delicious dips! 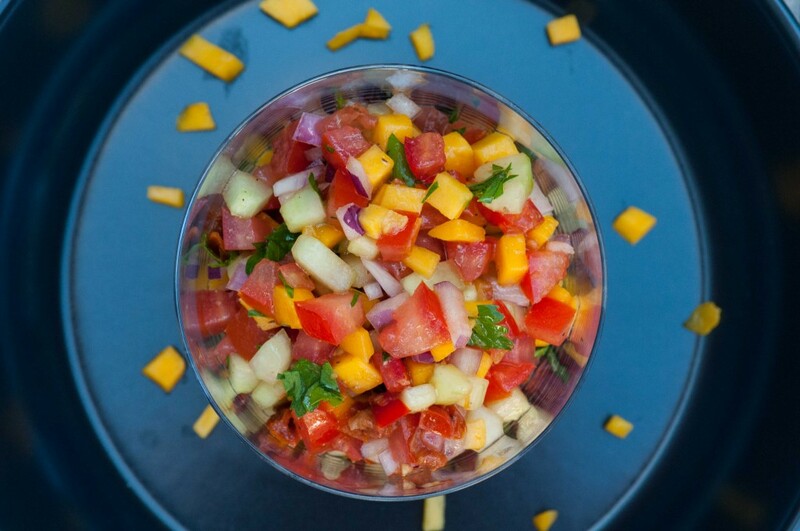 Perfect as a filling afternoon snack or as a fun appetizer. If you like the citrus flavoured Zaatar, please have a look at the Zaatar spiced quinoa that I posted a few weeks ago. 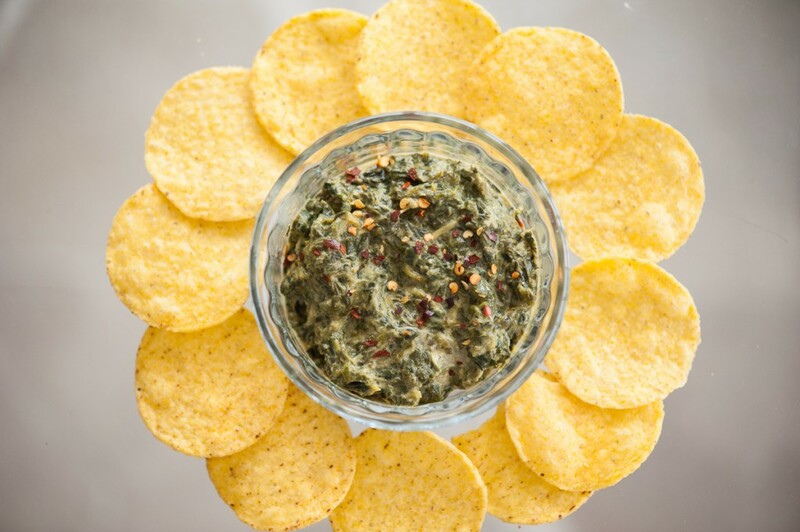 The Artichoke Dip is a true classic and the Zaatar Dip goes especially well with the apple sticks. 1. 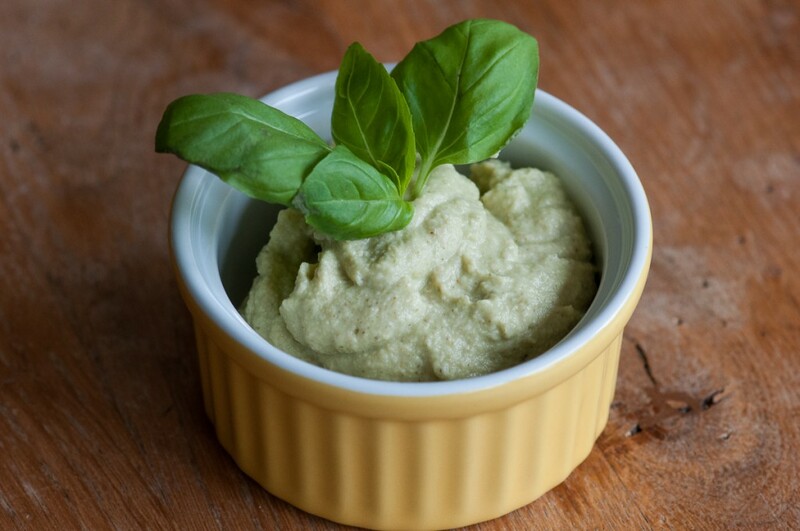 Blend the dips in a food processor until smooth. 2. 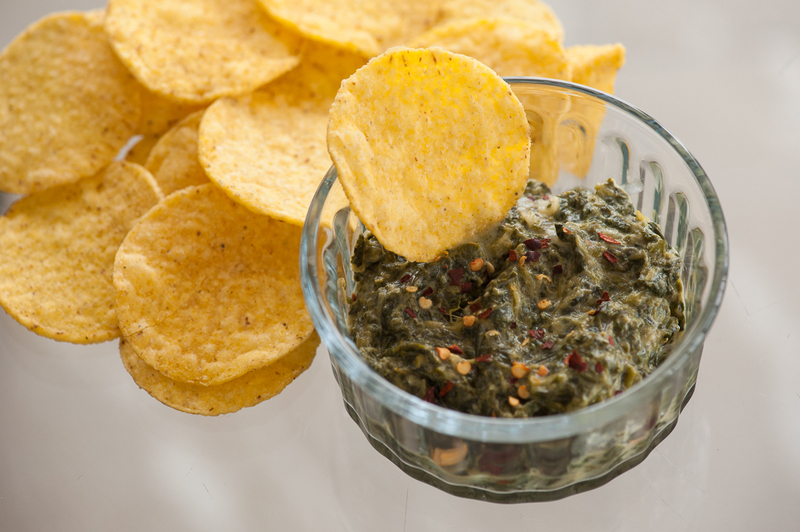 Drizzle some oil over the Spicy Zaatar Dip. 3. 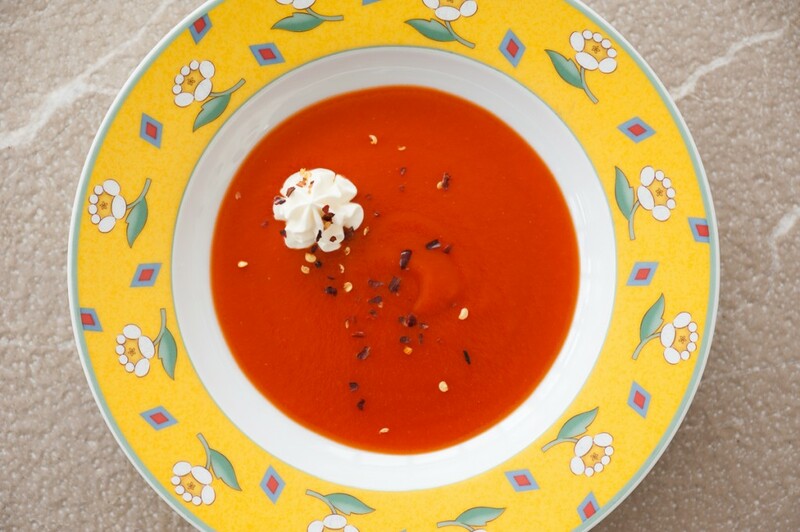 Serve with apple and carrot sticks. This dish can be made into small appetizer bites, or, served as a large “pizza”. If you want to make it vegetarian, substitute the anchovies with sliced shiitake mushroom marinated in 1 tsp apple cider vinegar, 1 tsp tamari soy sauce, 1 tsp olive oil, dash of salt. Process flour, salt and butter in mixer until crumbly dough. Add the sour cream and mix, then add the water. Refrigerate 30 minutes for easier handling. 1. Make (or buy) the puff pastry. 3. Slice the onion thinly, sauté with the garlic in some olive oil until soft. Add the salt, sugar and thyme and gently fry the onion another 10 minutes. 4. Roll the dough out to about 1 cm thickness. With a cookie cutter, make small rounds of the dough. On each round, sprinkle some parmesan, add some caramelized onion and aubergines. Finish by topping with a small sliver of anchovy. Lightly drizzle with red wine vinegar. OR, just cover an oven tray with the dough (on baking parchment) and spread the toppings over the dough base. After it is baked, cut into squares. 5. Bake in oven at 225C for 20 minutes. 6. When baked, decorate with olives and tomatoes. Such a great appetizer! Healthy, fresh and very tasty. Perfect finger food. Just make sure the stuffing is cut into small pieces and won’t poke holes into the rice paper. I do not deep fry my rolls but eat them fresh or bake them in the oven. 3. Cut all remaining vegetables (except for the bean sprouts) into fine sticks and gently fry in a little oil. 4. Season with ginger and soy sauce and taste. 5. Add the bean sprouts and quickly stir fry for another minute. 7. 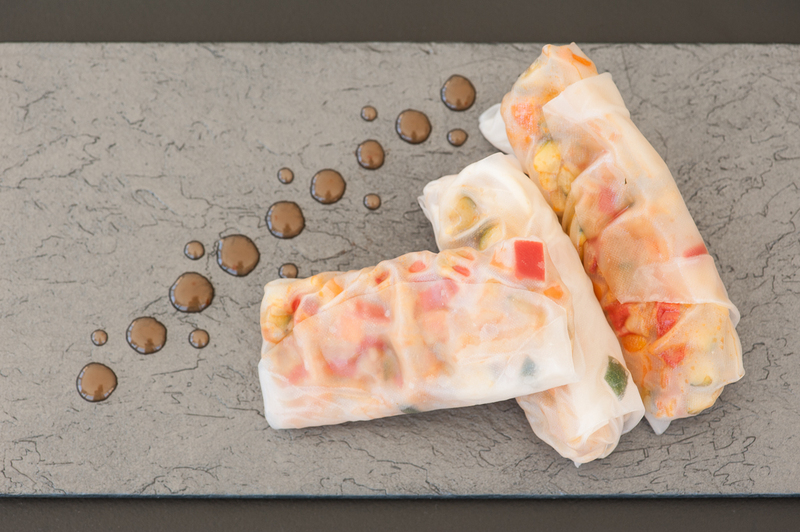 Place a line of vegetables on the rice paper and into a roll. Start them roll by folding a small piece over the ingredients, then fold in the sides to lock the filling in, lastly, roll the remainder of the paper. Delicious to serve as a dip with crackers/raw cut up vegetables or as a sauce together with your meal (salmon, meat, vegetables…). 1. Soften the pomegranate by squeezing/rolling the fruit between your hands. Cut in half and squeeze out the seeds into a bowl. 2. Mix the crème fraiche and the chevre with a fork. Add the onion, then the spices. 3. 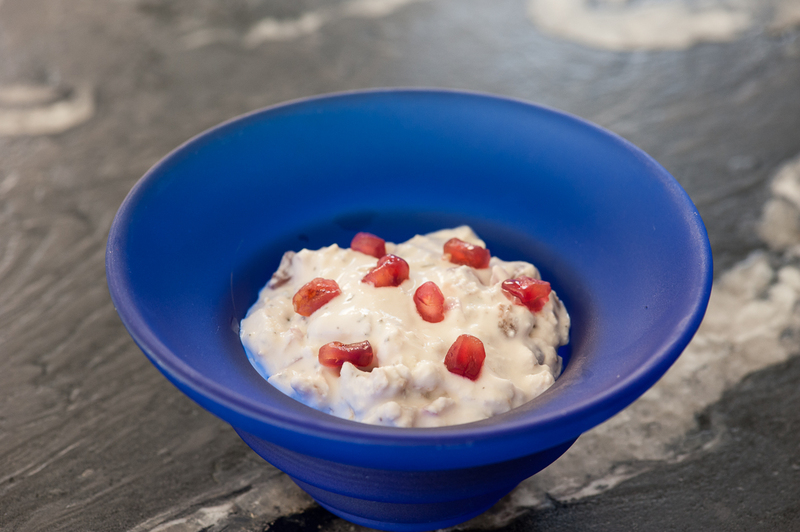 Stir in most of the seeds from the pomegranate but leave some for the decoration. This recipe is adapted from a Georgia (US) recipe. The versatile dip can be used as a sauce (e.g. with smoked salmon) or as a dip with nachos, vegetables or bread. Why not try the Gluten Free Crisp Bread with it? Add the cheese and crème fraiche. Stir until heated. Pour into oven proof dish (possibly several individual serving dishes). Bake in oven 15-20 minutes. 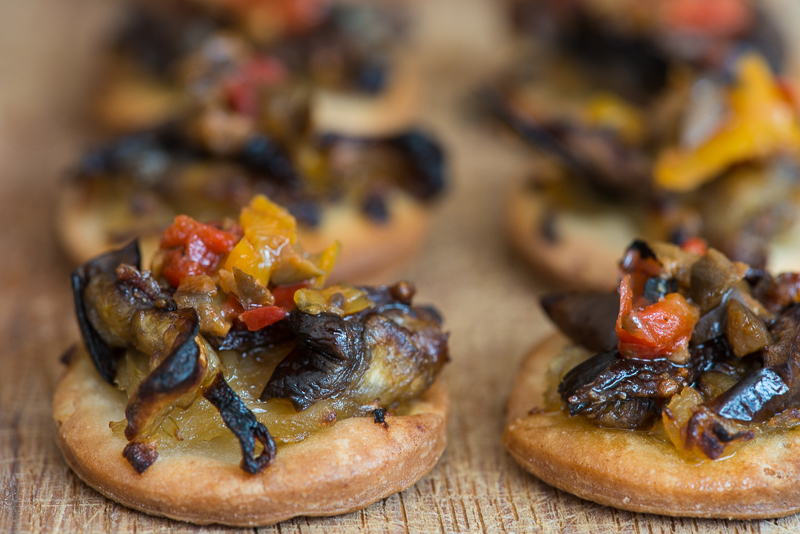 A festive starter and so easy to make. As well as being guten free it is a dairy free and low fodmap dish. Brush the aubergine slices with olive oil and fry until golden brown on both sides. Combine all remaining ingredients in a bowl. Place of spoonful of mix on each aubergine slice and fold. Light and fresh, possibly with a hint of garlic. Don’t overcook the vegetables, keep them crunchy. This is a low foodmap recipe. Mix the peppers with some lemon juice, set aside. Stir fry the courgettes in the oil over high heat, add the peppers and fry another minute. Season with salt and lemon pepper. 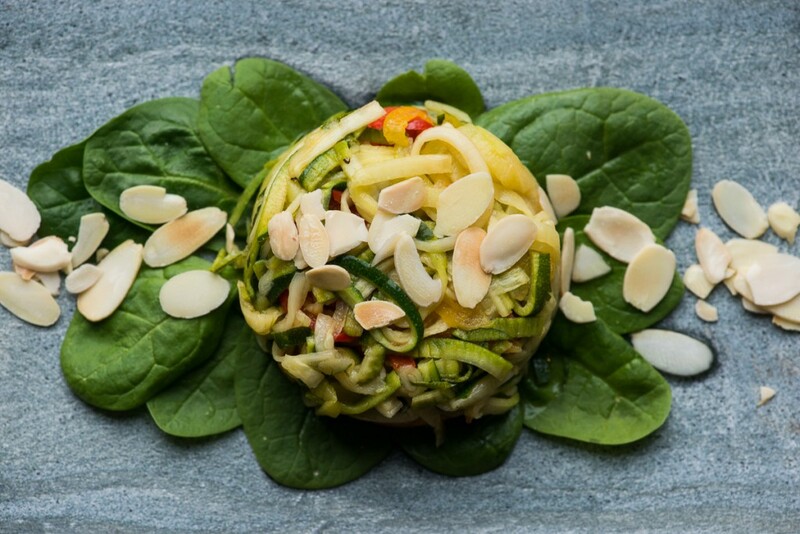 Line small molds with clingfilm and turn onto a bed of spinach on a servingplate. I love to make this dish with avocados but you can make it with other vegetables too. Cut off a bit of the round bottom of the avocado to make a steadier stand. Put the cut off piece in the hole where the stone used to be. Place the avocados on greased baking sheet. Spoon the mixture on top of the avocados. Baked until the mozzarella has melted and started to brown (15-20 minutes). 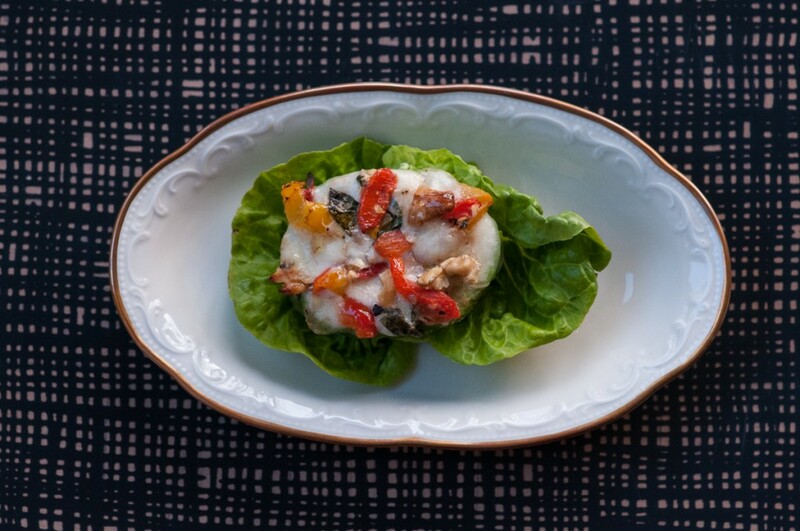 Serve on a piece of gem lettuce. (Concerning the size of the vegetables above, they should fit into the aubergine you’ll be serving in – see photo). 1 cucumber (or an extra aubergine) to serve the sauce in. Place all vegetables in oven proof shallow dish, drizzle with oil and vinegar. Season. Slice the 2 aubergines lengthwise. Cut crisscross in the flesh, drizzle with oil and sprinkle some salt on top. Bake in oven with skin side down for 40 min. Carve the flesh out of the aubergine taking care not to damage the skin. Chop the carved out flesh and sauté in olive oil. Season with salt and pepper. Slice the courgettes and mushrooms. Saute in a pan. 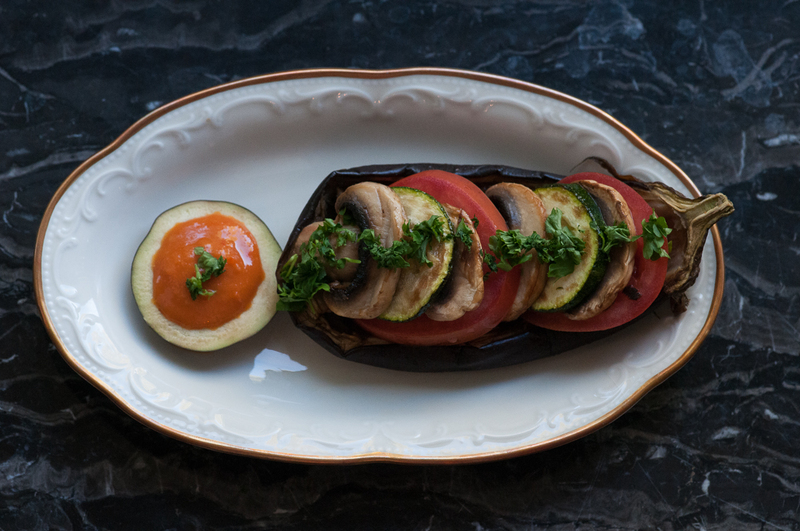 Assembly the stuffed aubergines by placing some aubergine flesh in the bottom of the empty aubergine skin, then layer the slices of courgette, mushroom and tomato on top. Bake in 150C oven for about 25 minutes. 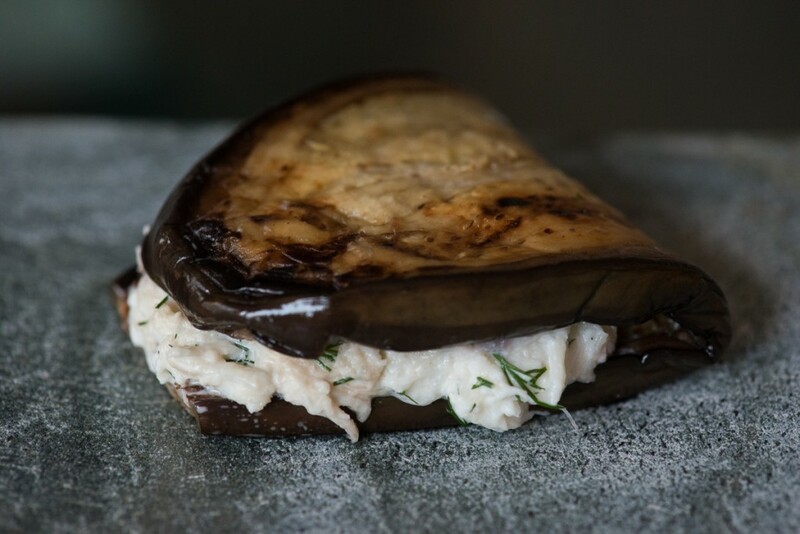 Place the stuffed aubergines on a plate, decorate with some chopped parsley. From a cucumber (or an aubergine), cut thick slices and remove seeds and some of the flesh, leaving a large hollow ring. Place on the plate. Spoon some of the sauce into the cucumber ring. Pour the remaining sauce into serving saucer. To be served as a nibble with crisps. Or really with anything you might like. 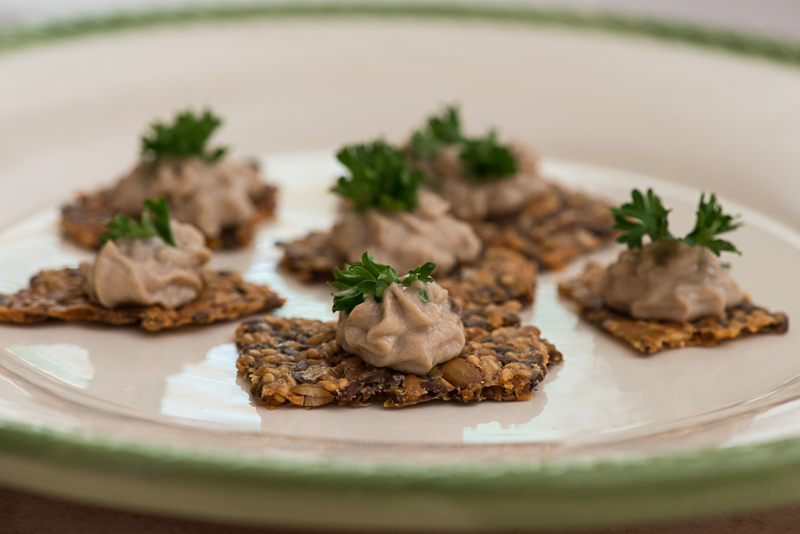 Can be used as a wonderful spread on canapés, a cold sauce with a tuna steak and in many other ways. Should be stored refrigerated with a tight cling film wrapping. In a food processor, pulse all ingredients until smooth. 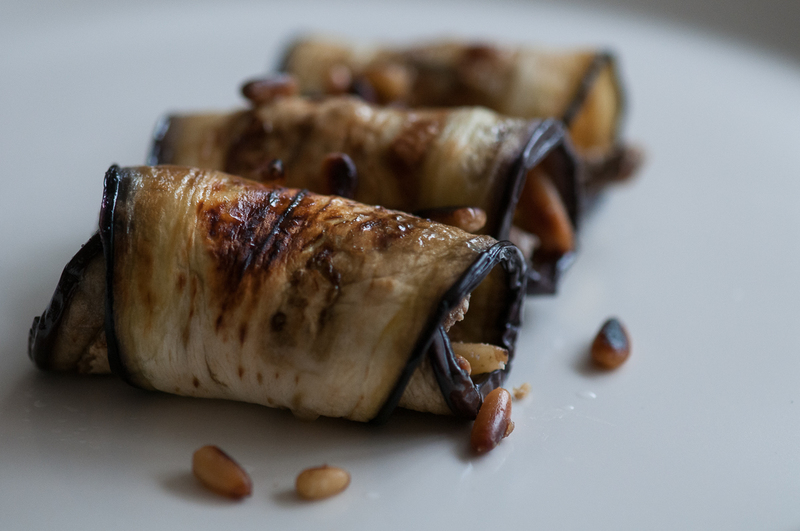 These Aubergine Rolls are easy to make and can be filled with many different kinds of stuffing. They may be served hot or cold. Add some crème fraiche and let cook for a 1-2 minutes. Add the pine nuts to the chanterelle mix. At one end of an aubergine slice, place a small spoonful of chanterelle mix, then roll it up. Do the same for all the slices. Serve on plates and decorate with pine nuts. Amazingly good and traditionally gluten free. The Russian kitchen does not use wheat flower in this dish but uses buckwheat instead, which makes for richer blini with a fuller taste. Buckwheat does not, inspite of its name, contain any wheat. It is actually a relative to rhubarb. Melt the butter and let cool. In a bowl, combine yeast, milk, cream, egg yolk and the melted butter. Combine the flour and corn starch with some salt and add to cream mixture. Let stand, rise, in warm place for about 90 minutes. Whisk the egg white into stiff foam and fold into the cream mixture just before frying. Using a spoon, drop small amounts of batter to a heated pan and flatten them slightly with the spoon. Turn once when gold brown. 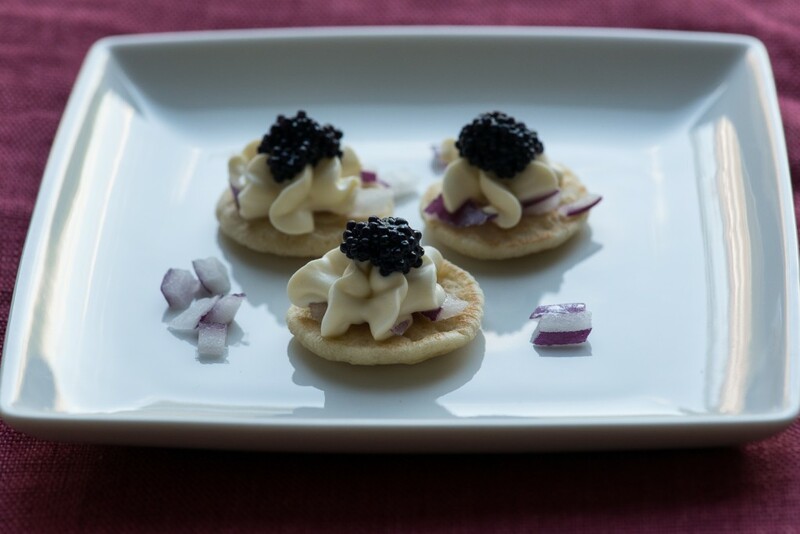 Serve with the onion, crème fraiche and lumpfish caviar. This starter takes a while to prepare since everything must be cut into really fine pieces. Quite time consuming but definitely worth it! The flavours will come out much stronger and also mix better with eachother. 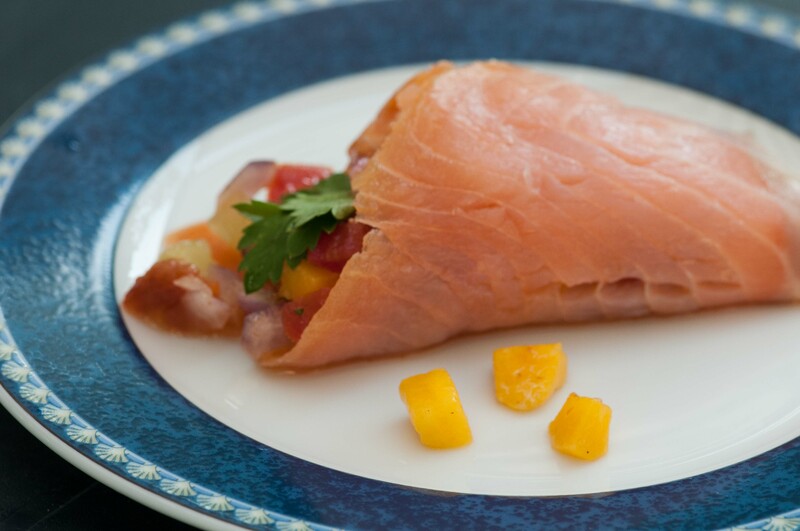 Fill a rolled up slice of smoked salmon.